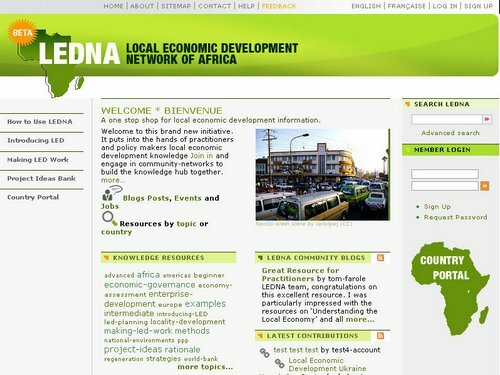 LEDNA – the Local Economic Development Network of Africa. My friend, former colleague and fellow blogger Christian created this lovely site with Drupal on behalf of the Swiss Agency for Development and Cooperation SDC (& UNCDF, gtz, ILO + USAID). Christian actually tested his design on me and others some time ago, using Silverback and directly implemented our feedback to improve this site (Silverback & Evernote are some of those reasons why I am sometimes longing for a combination of a MacBookPro and an iPhone…). The LEDNA website aims to pool “local economic development knowledge” and “engage in community-networks to build the knowledge hub”. In other words: the LEDNA website shall provide a community of networked activists who are active in the field of local economic development and want to exchange experiences and opportunities with each other. I see it as an independent online resources that helps pooling different experiences from and for Africa by Africans. Hence the name “Network OF Africa” (instead of for). Given the unstable internet connectivity in many African countries and a missing incentive for stakeholders (= How can I benefit of this network as a local planer? ), the website itself isn’t the best solution for gathering knowledge – but it sure provides a step in the right direction and it now only depends on how it will be marketed and sold to those knowledge providers who are supposed to contribute content. After all, what really matters (I think) aren’t studies and political papers only, but real experience from the ground that provides a clear picture of what worked and what didn’t. I really hope that this site takes off and turns into a vivid network of real-life experiences – and doesn’t only cover positive news (= what donors want to hear). As for the website itself – kudos to Christian for this wonderful setup so far! JK! Thanks glad you like the local economic development network of Africa site- the whole project was funded by SDC with contributions from other donors- but was undertaken at the request of local governments across Africa. Christian has done a good job indeed on the design of the web site- I hope you find the knowledge architecture and content helpful too, this is my part of the project, as well as facilitating the development of our social network. Our aim by the way, from the knowledge side, was to provide a critical mass of knowledge codified in such a way that it was useful to new and experienced practitioners. On the incentive to use, my first and quickest response is- this is the largest resource on local economic development in the public domain that is peer checked, unbiased and free- the least it will do is to save time on searching for methods, ideas, examples and practitioners- and we hope that will be enough to start an exchange with and between the community. As with any community, it takes a bit of effort to share knowledge and ideas (as I am doing now, and you do) but with a few people like us the network will grow, becoming increasingly more useful to practitioners on the ground we aim! You are right however, to really get experiences on the ground shared and understood we need to facilitate the development of our social network and facilitate knowledge sharing. I love the concept of sharing failed and bad practices also, but find few projects, donors or ‘beneficiaries’ who want their problems to be codified!